This is the first of a number of pre-Christmas deals we can expect from Tesco Direct – hopefully! It isn’t a bad deal, either, if you have a child in the family of the appropriate age. 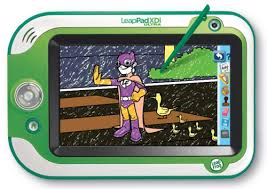 You will earn 1,000 bonus Tesco Clubcard points when you buy a LeapPad tablet – specifically the Ultra XDi model. This sells for £99. You can find it here on the Tesco Direct website. Until the 23rd November, you can combine this offer with Tesco Direct promotional code TDX-GWNT. This gets you a £10 discount when you spend £100 on toys, which would only involve adding an extra small item to your order. With the added £10 off, this deal may even fall into the category of ‘things worth buying in order to re-sell them on eBay’. You’d need to take a careful look at resale prices and the postage costs of the tablet, which may be substantial. The deal is available until December 10th.